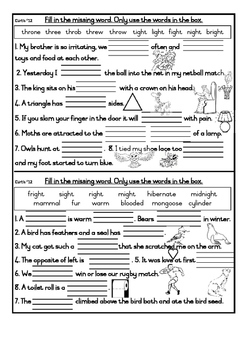 A phonics cloze (sentences with missing words) worksheet. Children have to choose words from the box and fill them in the sentences. The words have lines that you need to write in (head, tummy and tail lines), this encourages good handwriting. The words all have either the "thr" blend/trigraph or the "igh" blend in them.